Enjoy Boyan performing timeless classics from soul, jazz, RnB, pop, and more. 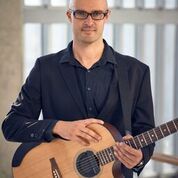 He is a Bulgarian American professional musician who specializes in romantic instrumental music on the acoustic guitar. He is a graduate of Berklee College of Music in Boston, MA, USA and has critically acclaimed success with his Boston based trio, B11.